The Board of Managers meets the first Wednesday of each month in the District office in Hallock, MN beginning at 8:00 a.m. Special meetings are held from time to time at the discretion of the Board. 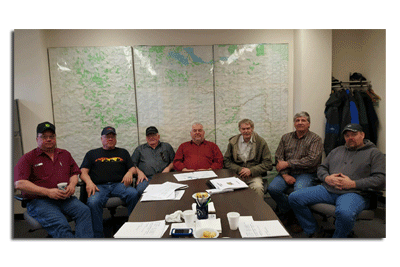 Advisory meetings are held at least once per year as required by law and otherwise as determined by the Board. All meetings are properly posted as required by law. Dan Money has been with the TRWD since 1991, and holds a Bachelor of Science degree in Aquatic Biology from Bemidji State University. He was born and raised in Kittson County, and resides in Hallock, MN. He is a member of the Red River Watershed Management Board and the NRCS Minnesota State Technical Committee. In addition to all administrative duties, he does water quality monitoring, project management, reporting, and planning. To contact Dan, please e-mail him at Dan.money@tworiverswd.com. Employed at TRWD since 2010, graduate of University of Minnesota Crookston with a B.S in Natural Resource Management. Primary job responsibilities include performing topographic surveys, stream flow measurements and construction inspection. To contact Matt, please e-mail him at :matt.thompson@tworiverswd.com.